"Every year in the ruins of what was once North America, the evil Capitol of the nation of Panem forces each of its twelve districts to send a teenage boy and girl to compete in the Hunger Games. A twisted punishment for a past uprising and an ongoing government intimidation tactic, The Hunger Games are a nationally televised event in which "Tributes" must fight with one another until one survivor remains. Pitted against highly-trained Tributes who have prepared for these Games their entire lives, Katniss is forced to rely upon her sharp instincts as well as the mentorship of drunken former victor Haymitch Abernathy. If she's ever to return home to District 12, Katniss must make impossible choices in the arena that weigh survival against humanity and life against love..."
This movie make you also questioned yourself if you picked for the Hunger Games. You sure like your life controlled by the the Captiol, wealth government? About the story of Hunger Games begin - Katniss must survive and can kill 23 other Tributes to let her going to her home so safety? 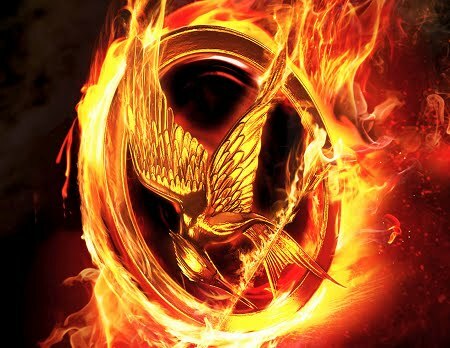 I surpassed that the Hunger Games competition is a reality-live television show that pits 24 children, one male and one female from each of the 12 districts, age 12-18, against each other in a fight to the death! Some viewers just enjoyed to watch it as it's fun to see someone accept the fate of death? Do they don't have any feeling and not understand the 12 districts are suffering and face a very poor situation when they are working for the government. Weird the city people are wearing the weird fashion but, they also have colorful clothes and cool hairstyles! 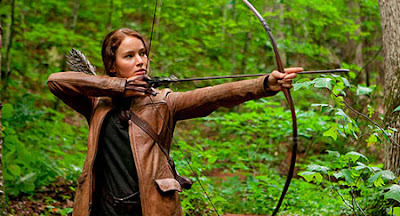 Some people in the twelves districts started to see Katniss Everdeen as heroine because she is different than others. That is why it is emotional movie to make the viewers want to know more about how the characters can be survive in the Hunger Games, Panem. I really don't like them to control the characters in the Hunger Games, because the government play their life to kill each other! It is really crazy, more like blood war! So, they cannot be avoid from this competition, unless one must be survive only. The most good moments was during Rues' death. Katniss never think them as her enemies only, she just give her best try to protect herself and what is her most important in her life. She love her youngest sister so much because she worried about her family's situation. I really love the effect of Fire effects for the District 12 team, it is very GREAT! Katniss and Peeta make good friendship to become the partners but, they become "lover" to gain more support from the viewers when they are in the Hunger Games. She is very good skilled at her archery, but advised not to take her main weapon because many people focused on her, make them want to kill her if she takes her weapon, bow and arrows. That is why she is careful and need to think twice before she do her action. Katniss can save her family, Gale, her best friend & lover and 12 districts from the Hunger Games in future or not? It got many lessons for you when you are in the survive games. What you will do with this? You can change the view of people in the city, wealth of government? Or you and your support team can go agaisnt them without a war? How? I think want to buy the books - Hunger Games! I love to read all stories books when I am free!